Daman Singh, who is a writer and daughter of former Prime Minister Manmohan Singh, had given readers a peek into her parents’ lives in her last book, Strictly Personal: Manmohan and Gursharan. 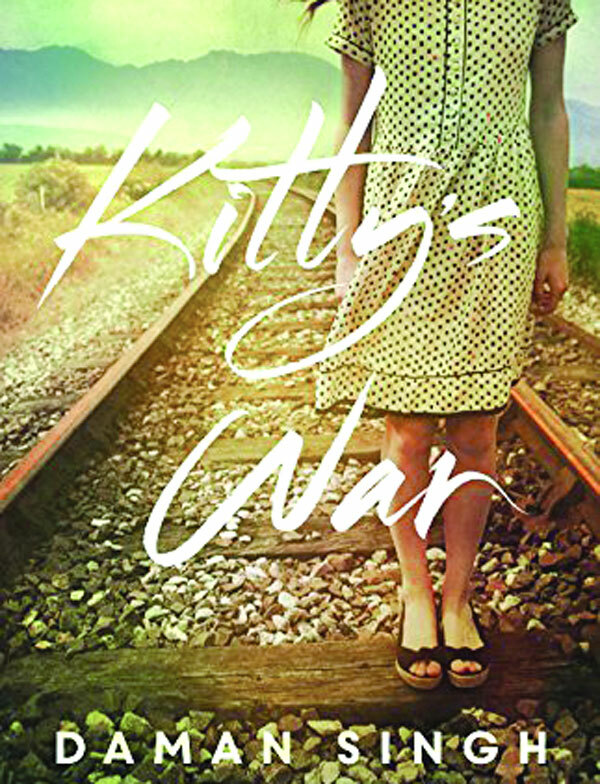 Now, she is back with a book — Kitty’s War — that deals with the direct as well as indirect impact of World War II on colonial India. It was not a natural inclination towards India’s history that led the author to this book, though. It was during a discussion with her parents for her previous book that Daman got an account of what it was like to grow up at the time of World War II. And that made her want to find out more. The author talks about the process of writing this book and the random associations she made while choosing names of characters in the narrative. She also tells us that for her next book, she is planning to research on how mental asylums function and what Governments do to help patients admitted there. In the first few paragraphs of the novel, you describe the protagonist, Kitty, almost like a cat — soft and little, seeking comfort, unsuccessfully trying to shut out the outside world. Why do you call her Kitty? My answer to that is actually very silly (laughs). When I was growing up, I had a cook book written by an Anglo-Indian, Kitty Riddle. And that name just stuck in my head. So, when I was thinking of a name for my book, it just popped out. And without even thinking, I named the main person Kitty Riddle. I didn’t even consider other alternatives. Some people said, “Why such a common name? You could have used something more unique.” But somehow Kitty Riddle was already in my mind. I don’t even switch to using Katherine in the novel. Because it was part of the culture to use nick names. But of course, she needed a proper name also. So, I have mentioned Katherine only once or twice. Is the animal imagery — Kitty’s initial description reads like a cat’s — intentional? The animal imagery was not intentional. It is something that you have picked up on and it is interesting; I will think about it. Maybe it was there on a subconscious level. Why did you choose this particular period in history — World War II? I was never interested in history as a student; I found it very boring. And for most of my adult life, it meant nothing to me. It’s only when I started working on my last book, which was a biography of my parents, and when I started asking them about their lives, that the history of those times became real for me. It was not just a textbook with names and places that you had to mug up. It was then that I got really interested in history. Of course, this is modern history. I am still not very interested in other kinds of history. And what fascinated me was, of course, not what the Government was doing or what the big leaders were doing. But what ordinary people were doing — how did they think? How did they feel? How did they deal with such complex and difficult things that were going on? So, I was really interested in that aspect. And I think some of it comes into this book as well. While talking to my father about his childhood — when he was a boy attending school in Peshawar — he said he would often listen to the radio and follow the news of World War II. And at that time, I thought to myself, “What does World War II have to do with us?” So, after I recorded that interview, and I had to research the time and period, I started reading about what World War II meant for India. And it was really a sort of revelation — I had no idea. Firstly, the military aspect. You know, India actually played a big role for the allies. And then, of course, the social and economic aspect. I decided then that this is what I want to write about. Can you shed some light on the role of Japan in our colonial past? Kitty struggles with the fact that Jonathan is too preoccupied with the war to write love letters to her. Is that an attempt to show how at the time of war, most women are forced into the ‘private world’ and most men into the ‘public world’? I hope not (laughs)! I hope I didn’t create this gender barrier. I think Kitty as a person was just more inward-looking. And I think she was somewhat protected from the war, or from what was going on in the world. So that’s why she is not affected by it in the same way that Jonathan is. What kind of war is Kitty involved in? We are talking about the war that is going on inside her mind, where she is being pulled in different directions. She feels that England is home, but she is living in India. She connects with everything that is British, but her upbringing has not really exposed her to what is India. So, she is living in a bubble. And it’s through the course of the book that she actually starts understanding a little more — not very much — about what Indians around her are like, how they think, how they feel. For instance, the way she relates to Ayah, who was always just a servant, but through the course of the novel, she does become more sensitive to the other woman. And even with respect to Chakarbatty, she starts with being rather snooty, but by the end of it, she develops sympathy for who he is. She might not express it in a grand gesture but I have tried to show that she becomes more sensitive. Sharp class barriers are created in the book only to be undone later. Why? The class barriers were very sharp in that world. What I tried to show was that it is possible for two individuals to cross those barriers. It can be done at an individual level, even though you couldn’t do it on a societal level. Why do you call the town Peepli? My previous book — a novel called The Sacred Grove — had a village called Pipri. So, I just changed it a little bit and never thought about it. In it, I have tried to give the flavour of either a large village or a small town. So, it could be any place really. I didn’t make it a special place. Do the Railways serve as a metaphor in your book for the conflict between war and development? When I started research for my book, I found out that one of the services that was badly affected by the war was the Railways. That’s why I zeroed in on it. Because it gave me a chance to express what was going on. At that time, our colonial Government was starved of funds because all resources were being pumped into the war. So, there was a general slowdown in administration; any new project would be shut down or put on hold. The Railways, which was about a 100 years old then, was a growing industry. The war meant they had to stop any expansion, hold new projects, repairs were delayed, equipment was getting faulty or overaged because they could not replace it on time. But what I found really startling was that the war was on in, say Africa, and bogies and tracks were being sent there from India. I found this really bizarre. You have railway tracks in India, and the Government thinks, “Oh well, these are not particularly important tracks. So, uproot them and send them out.” So, the Railways, too, went through a lot of turmoil. Coming back to the book, Kitty is a railway girl; they affect her father as he is a rail fanatic. And when he sees what is happening, he is heartbroken. That’s how it enters her world.